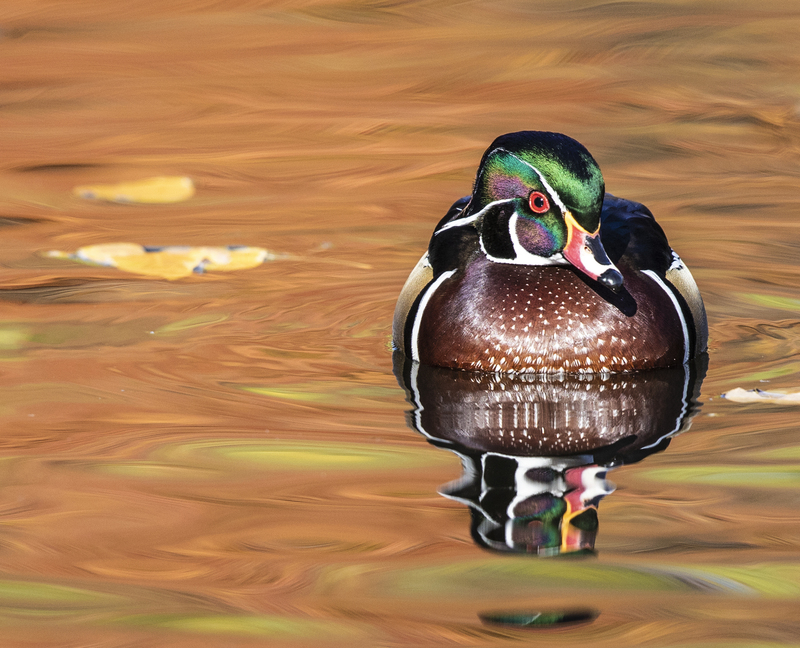 The wood ducks look great with the fall colors reflecting on the pond. Canon Hill Park is a lovely smaller park on the South Hill of Spokane. The park contains a pond that is not terribly large, but is quite popular with water fowl. Ducks of several sorts rest and feed here, the Canon Hill Park ducks.. The wood ducks were my favorite ducks today. The pond is filled by the city. I learned from a local resident that they have finally gotten the water level right. Not overflowing, but also nice and full. I”m sure the Canon Hill Park ducks appreciate the thought. I shot these photographs in the light near midday when the most direct sunlight is available. Trees in fall color surround the pond. The big weeping willows were still green, but the others were in fall color. Consequently, the reflections in the water were a virtual rainbow. The wood ducks were plentiful today. They tend to keep mostly separate from the mallards. Mixing in with any and everyone are the widgeons. I got some nice tips from a former Group Health colleague Dora Davis. She was there with a friend shooting the birds, too, as were about 5 other people. Dora knew that the ducks would like the little crabapples on the ground by the pond. Because she gave us that tip, we got to capture a photo of them eating one. 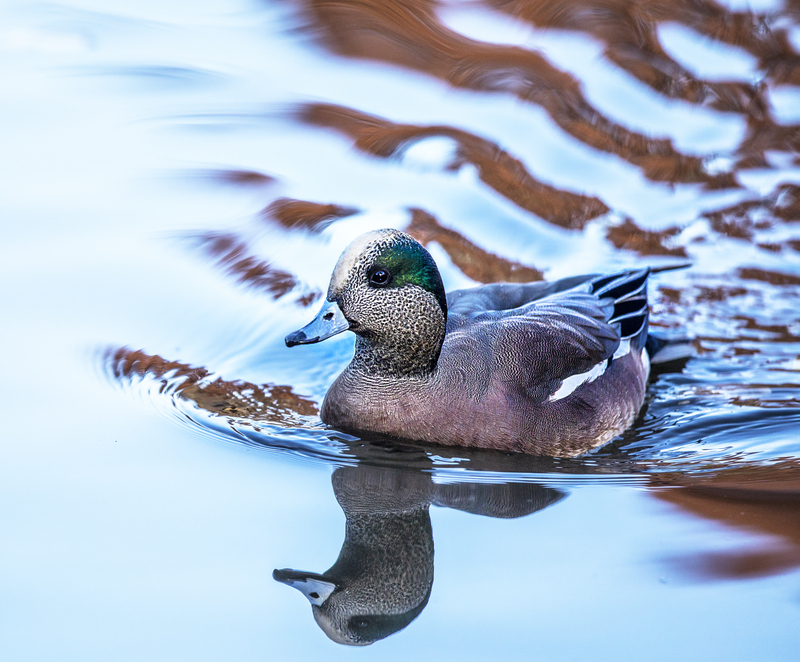 The ducks are so plentiful that it was simple to take photos. To get the best photos it was helpful to take many shots. A photo of the back side of the bird or any photo not sufficiently sharp was of no use. There is gentle swimming around a plenty, but not a lot of flying or other action. Be patient to capture shots of them with wings spread. That is not likely to happen on the edge of the pond closest to you. Therefore, a powerful telephoto is helpful. All these images were captured using a 500 mm f/4.0 Canon lens mounted on a Gitzo tripod with a Really Right Stuff gimbal head. The sturdy platform makes for cleaner shots. 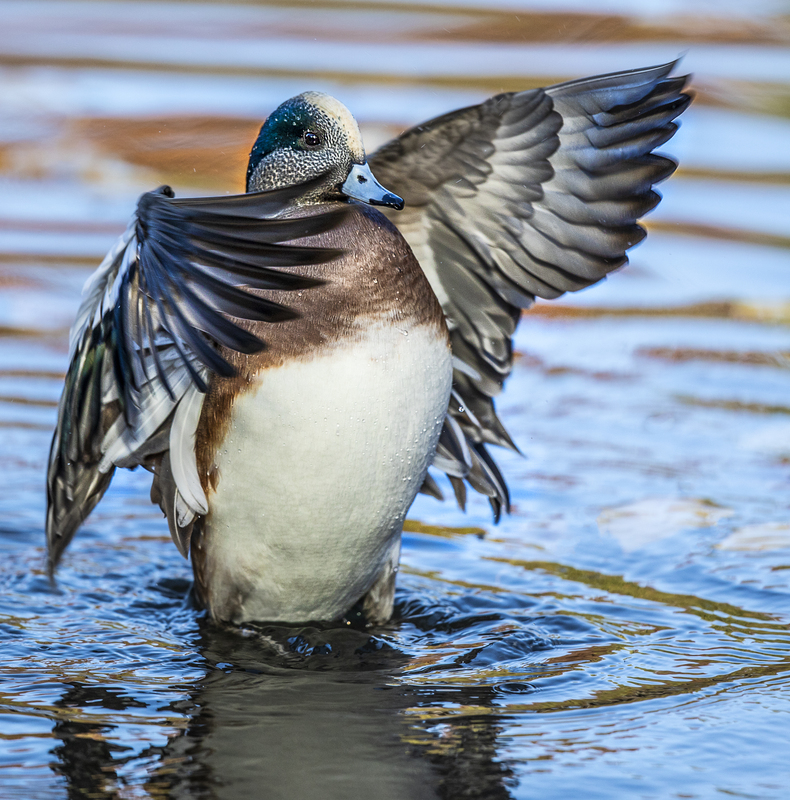 The widgeon has a distinctive green stripe on its head. Photographs of the Canon Hill Park ducks may not be worth much without a good telephoto, but the park is fun with or without a camera. 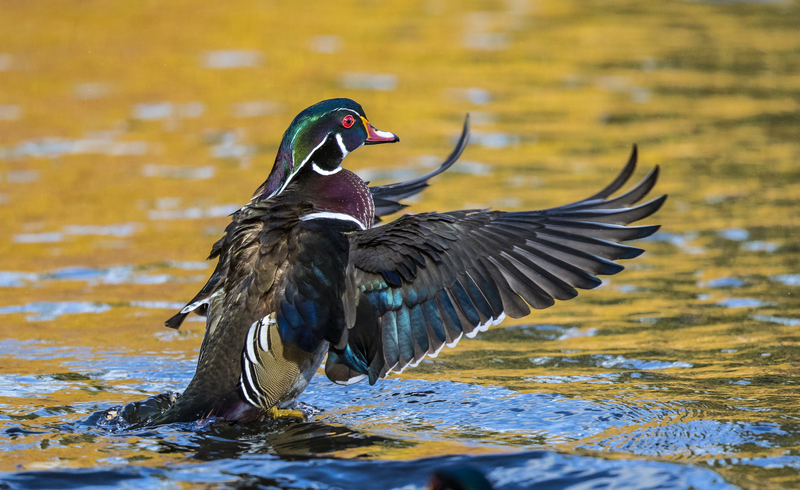 Drop by, catch a glimpse of the wood ducks and consider a picnic. It is a lovely park and should be seen. For that matter, bring your binoculars and see the ducks really close up. 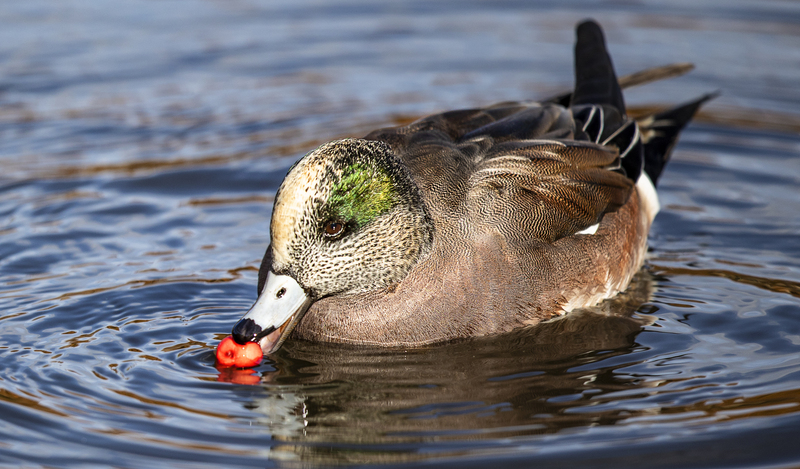 Here’s a widgeon having a crabapple snack. The pale blue bills on the widgeons were one of my favorite items on the pond today. 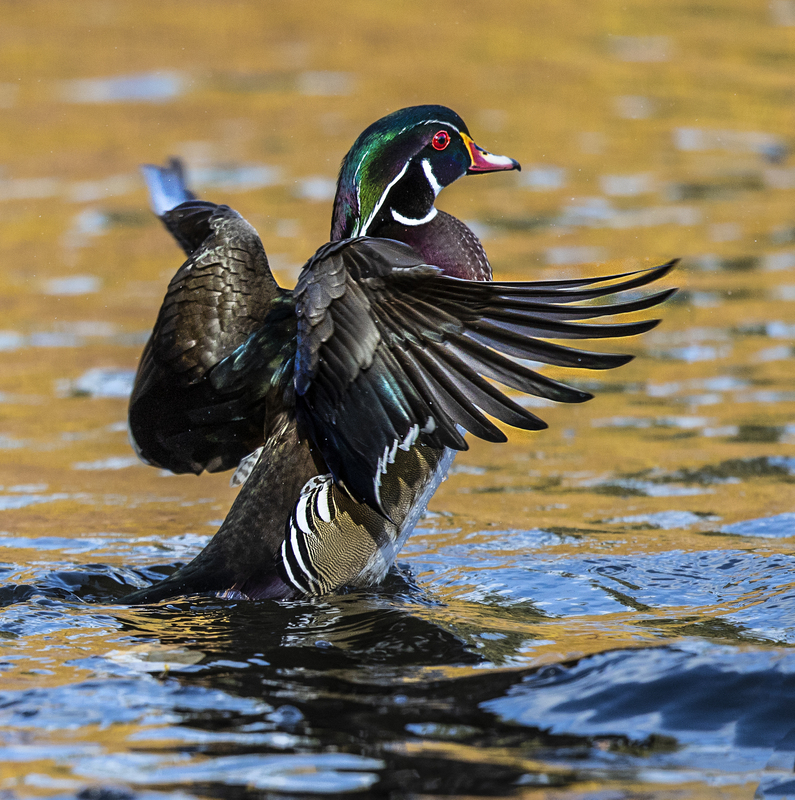 The green willow and red maple made spectacular reflections to set off this wood duck.